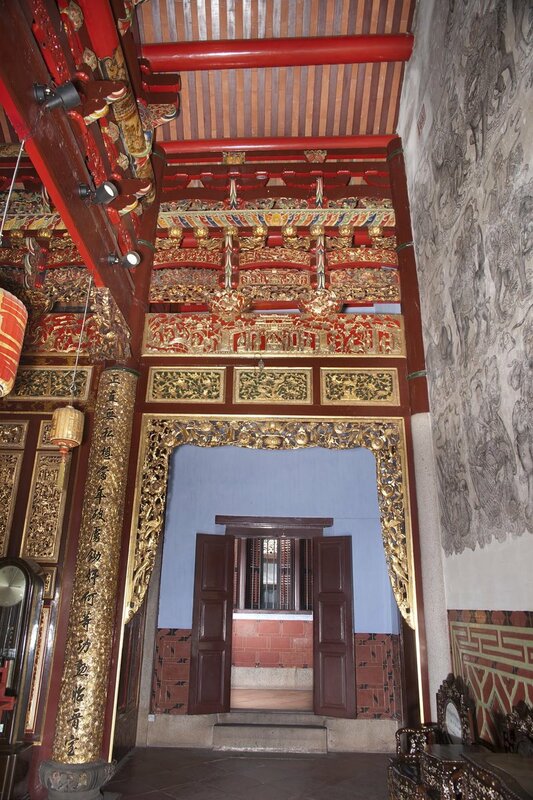 Reputed to be the grandest clan house in Malaysia, the Khoo Kongsi is located in Cannon Square, right in the heart of Malaysia’s state of Penang’s UNESCO Heritage site. 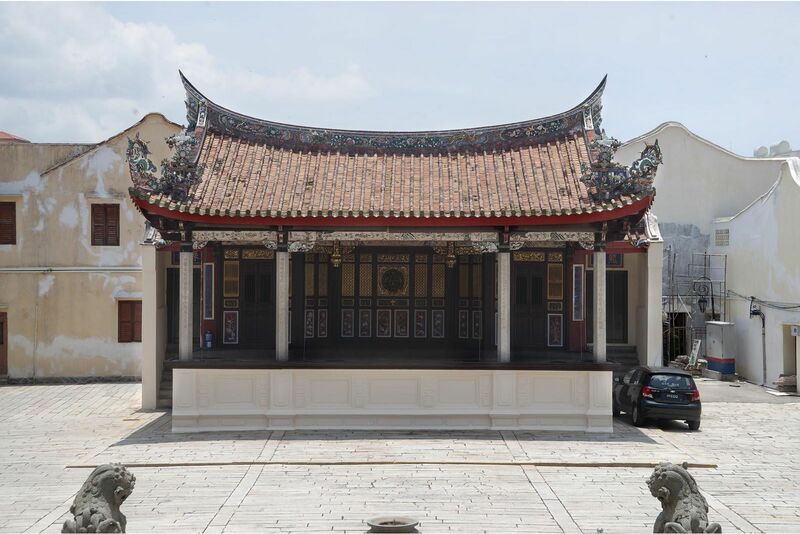 It has retained its authentic setting, which includes the administrative quarters, a theatre stage, and clan members’ shophouses and terrace houses all clustered around a granite-paved square. 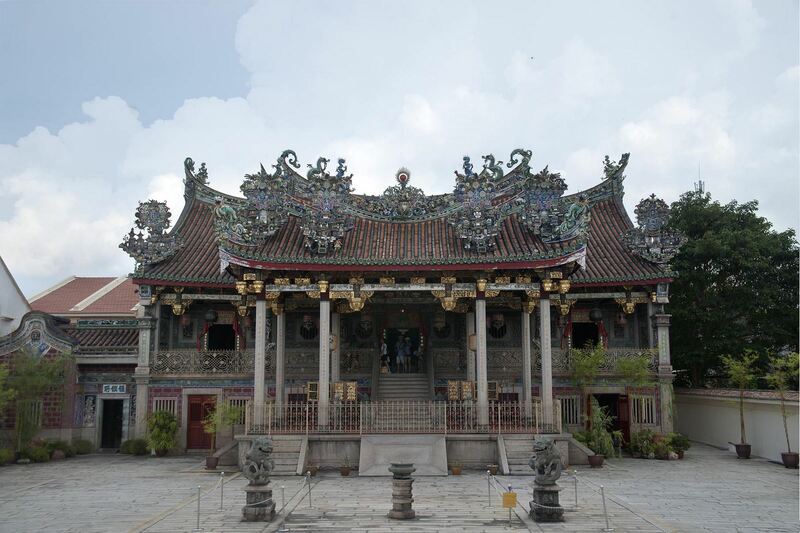 It was an ambitious project to showcase the new-found wealth of the Khoo clan in the late 1800’s. 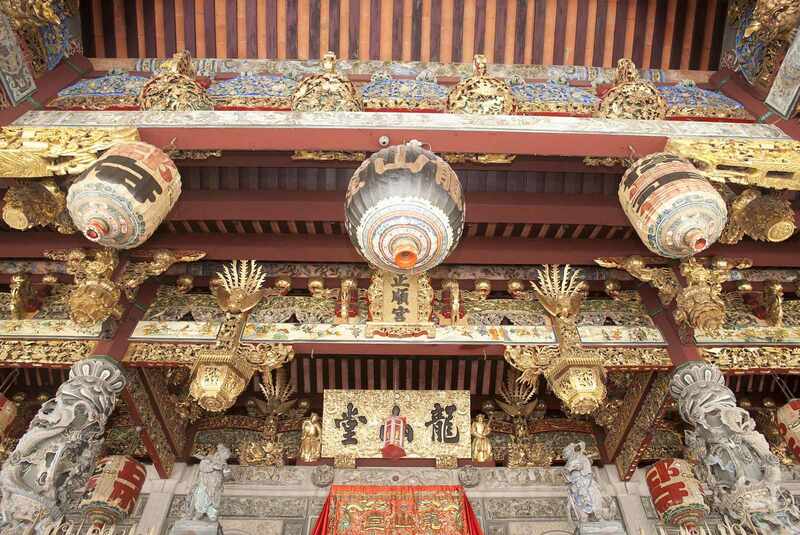 Construction started in 1894 and was completed eight years later. 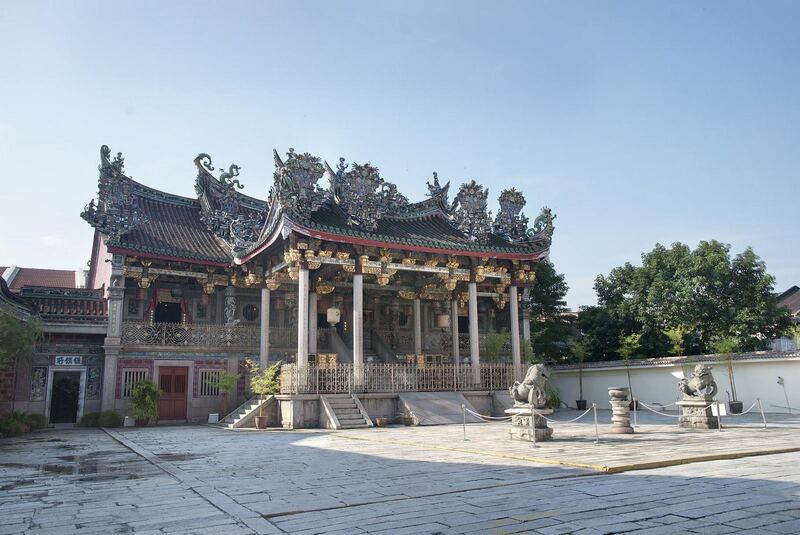 However, it was razed by a fire just 29 days after its official opening. 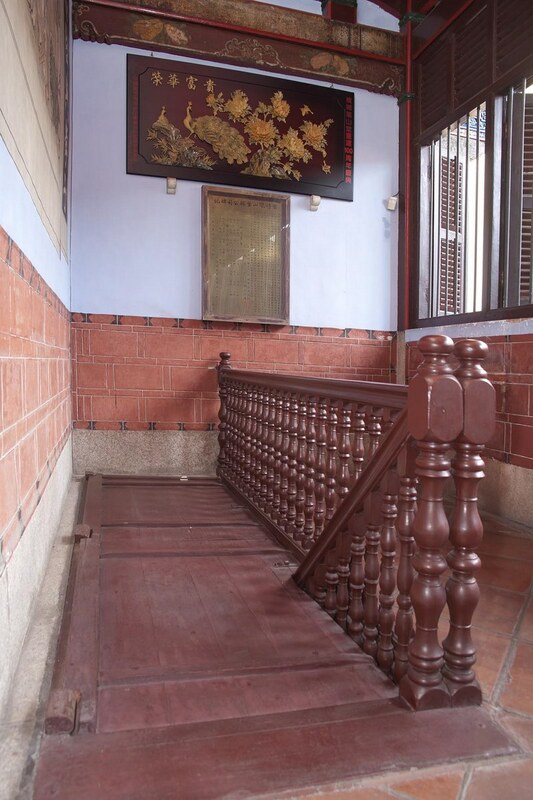 In an attempt to avoid a similar fate (believed to have been due to the ostentation of the original project), a scaled down version of the original was rebuilt in 1906 and survives until today. 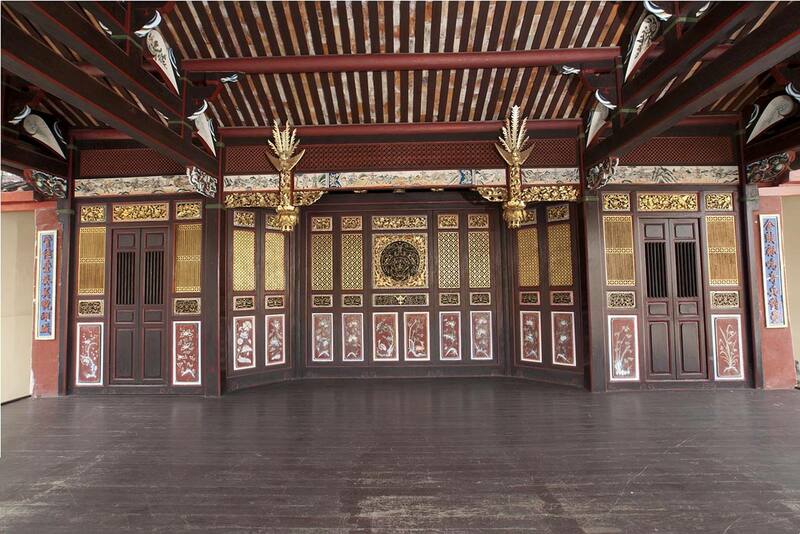 Materials, master craftsmen, and artisans were all imported from China to execute the grand project. 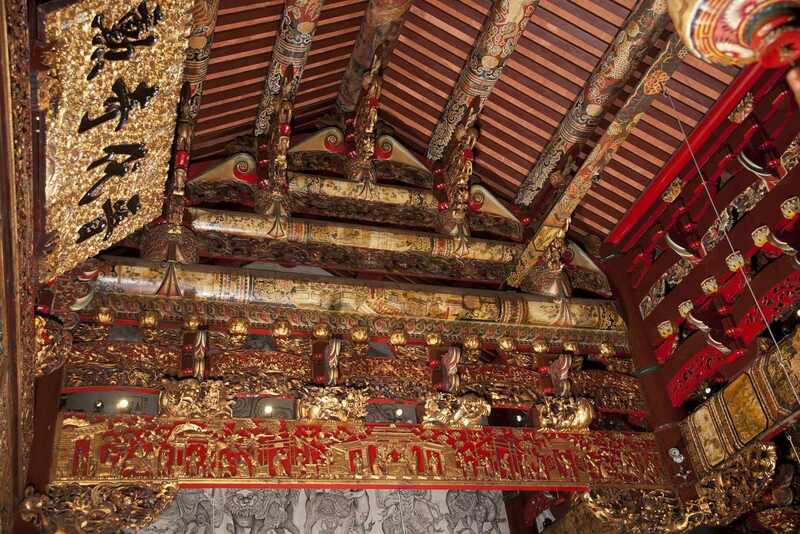 The structural elements were of local timber while the intricately carved timber panels and screen, sculptures and ornaments were imported from China. 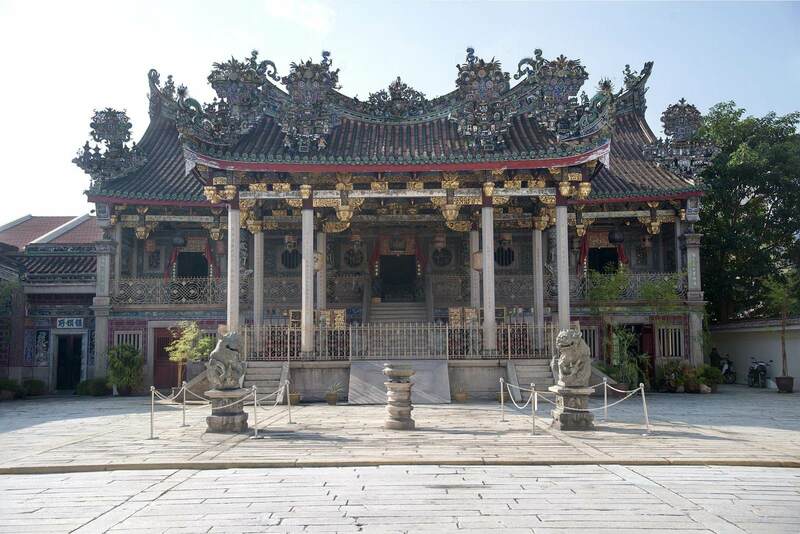 The most culturally significant building in the Khoo Kongsi is the Prayer Pavilion, which directly faces the timber-based theatre, both of which are placed in the centre of the huge courtyard surrounded by other built forms. 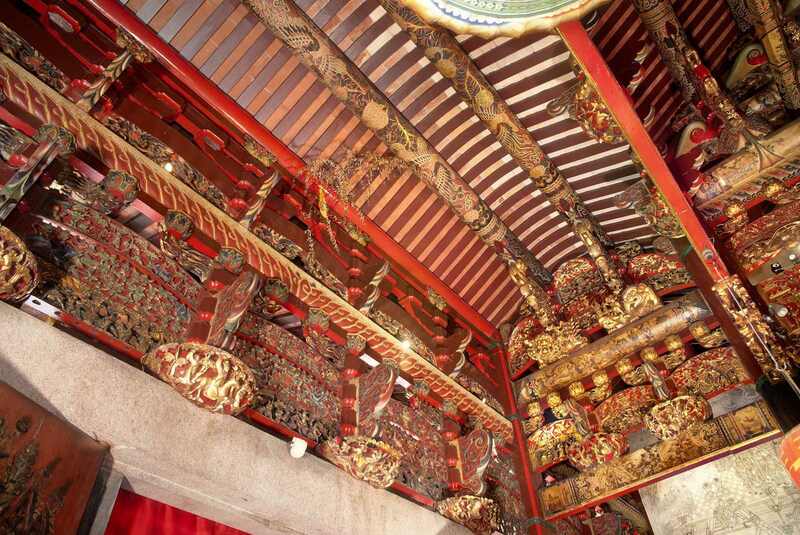 Refined woodcarvings almost entirely fill up the timberwork of the Prayer Pavilion’s roof truss, front verandah and central hall. 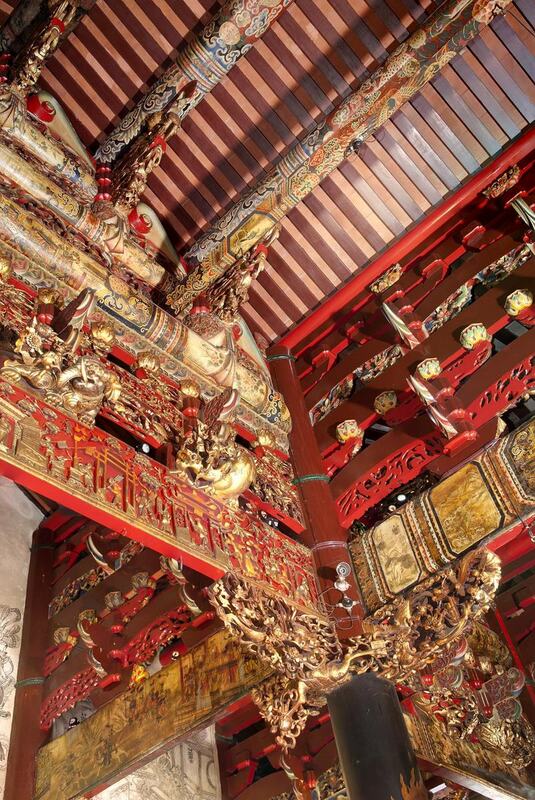 These woodcarvings are either painted in various colours or gilded, resulting in delicate craftsmanship reflecting the clan’s collective fortune. 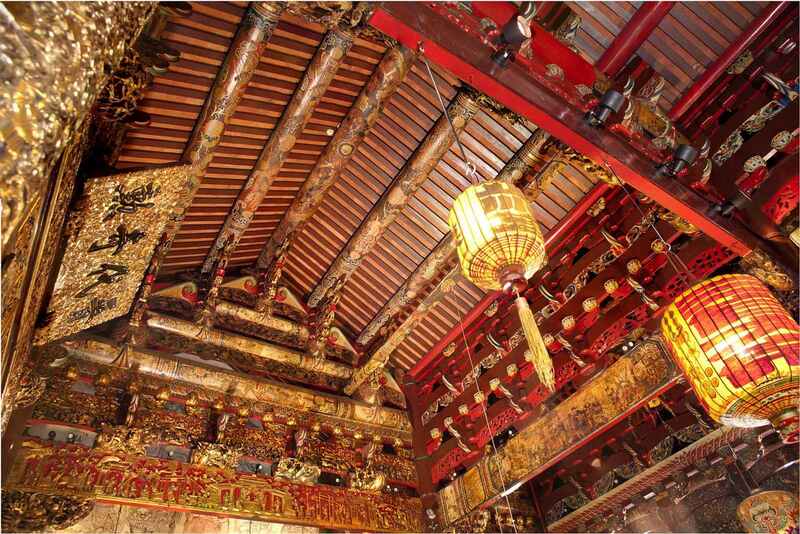 The roof trusses of the Prayer Pavilion presents the most important architectural expression of the Khoo Kongsi. 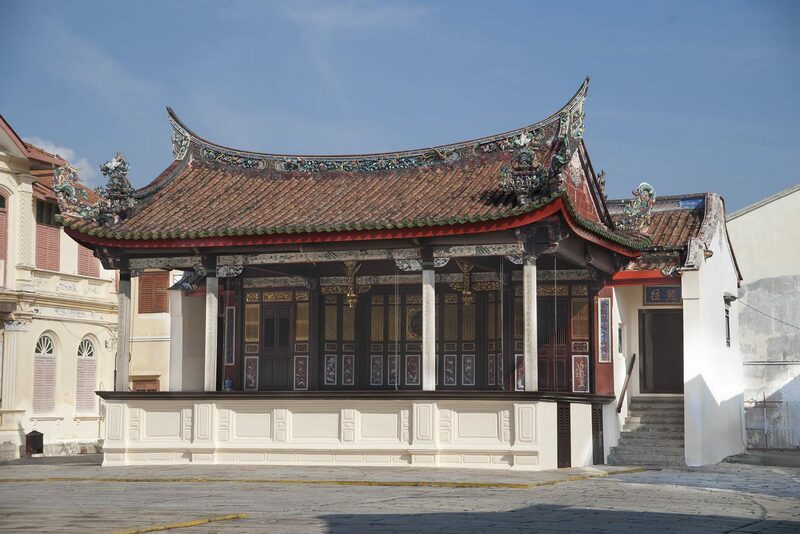 The trusses are supported by four principal columns, and 21 purlins from the front to the rear verandah of the main hall. 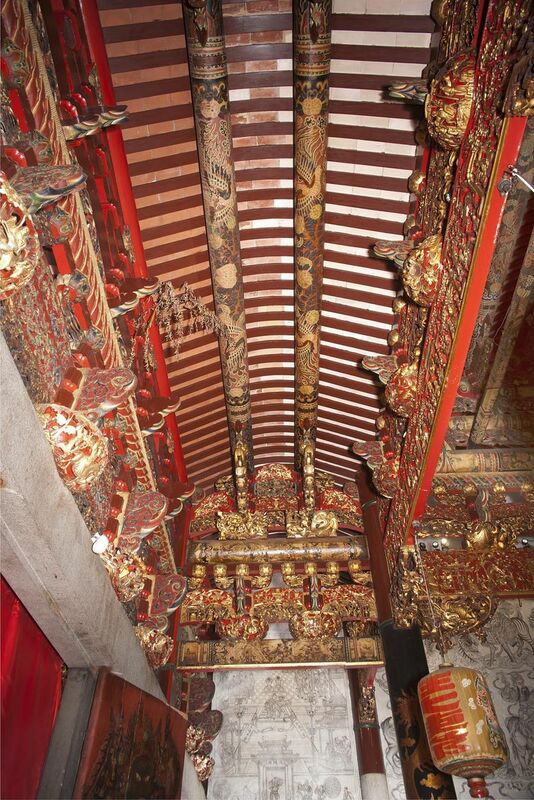 The front verandah and the altar have curved ceilings, with the highest point placed in the centre. 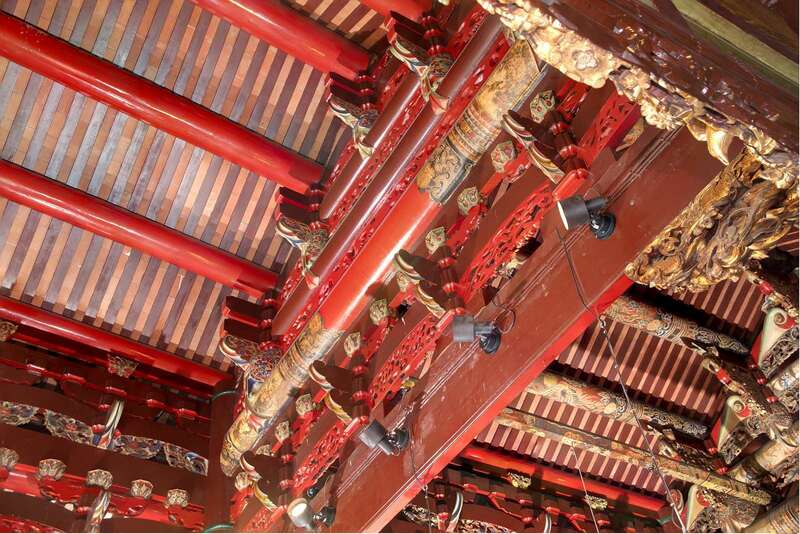 The main truss is in the form of three round cross-beams, supported tightly by five melon-shaped queen posts. The queen posts feature cantilevered bases and brackets that spread outwards. 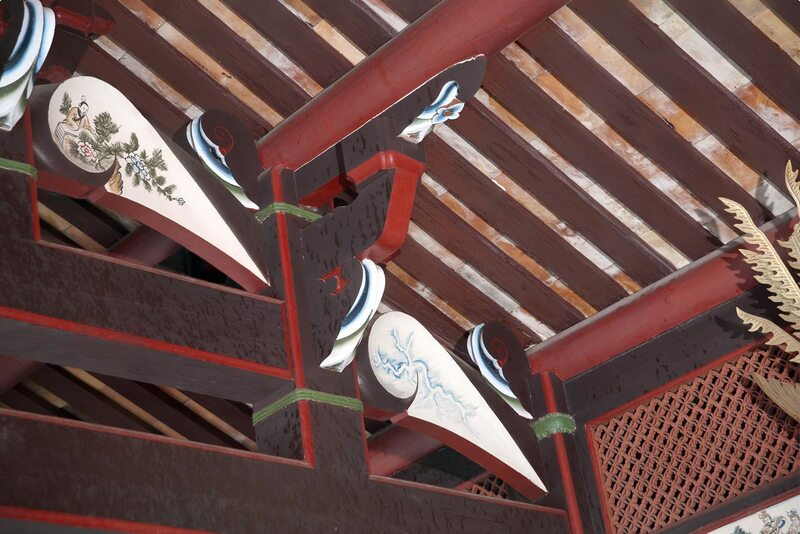 Above the bases and brackets are small tongues that support the purlins. Beneath the crossbeams and queen posts are rectangular supporting truss beams, to which five-arc-bracers, bases and brackets are attached. 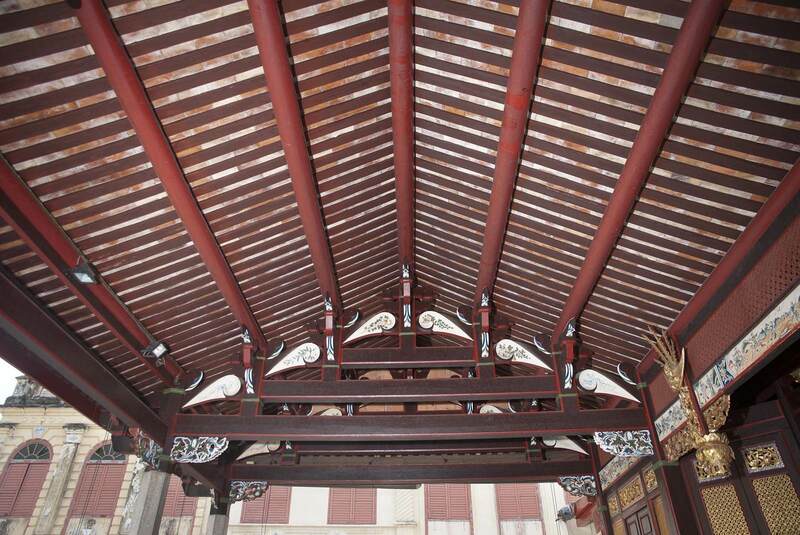 This has the dual function of making the roof trusses structurally stronger and aesthetically more pleasant. 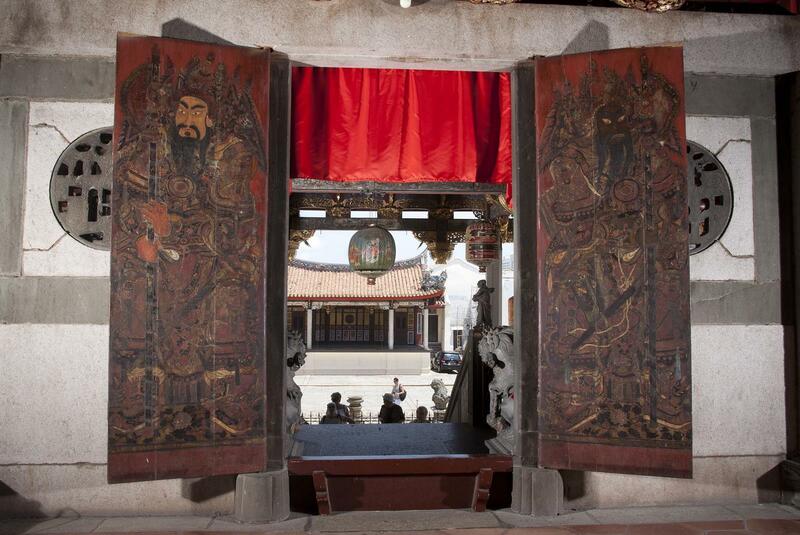 A unique Chinese architectural feature of the Prayer Pavilion is the dou gong, consisting of a square wooden block with grooves on the surface (dou or the base) and an arched bracket (gong) protruding from a post and is attached to another base. 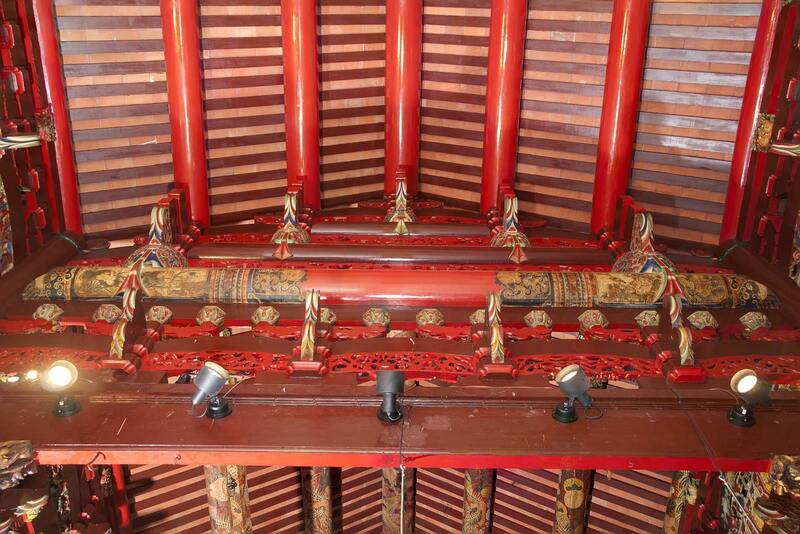 The pavilion has a complicated roof truss system held together by various dou gong. 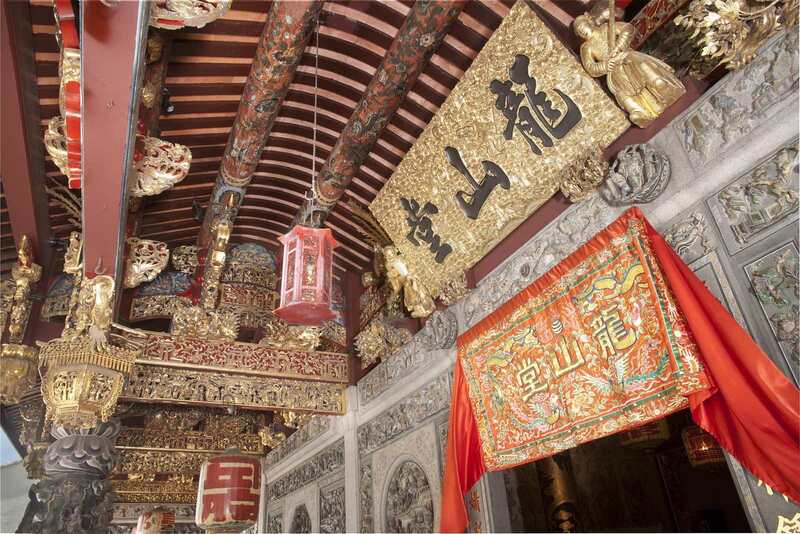 There are two main shapes for the dou, namely the peach-shaped and the octagonal lotus. 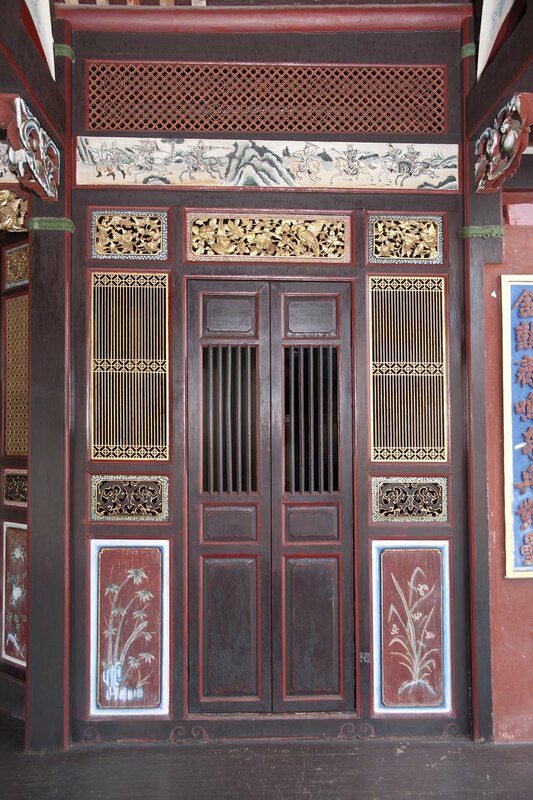 The gong or brackets, on the other hand, offer more variety and each depicts a finely carved motif – a lotus flower, a dragonhead, a lion, a flying goddess, an eagle – to symbolize immortality, health, wealth, abundance, protection against evil forces, blessings and many other qualities deemed to signify a good life. 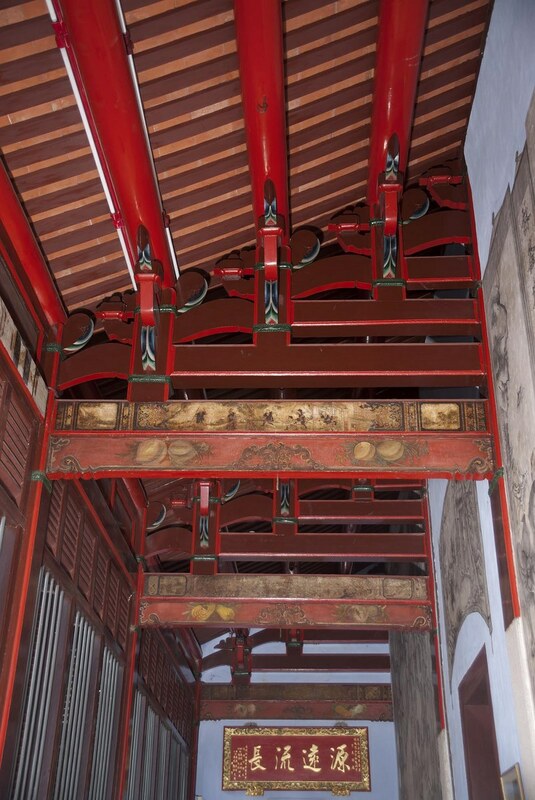 The function of the dou gong is to distribute the weight of the roof truss to the crossbeams, and the use of timber enables each to fulfill this role as well as serve as aesthetically pleasing finely carved features. 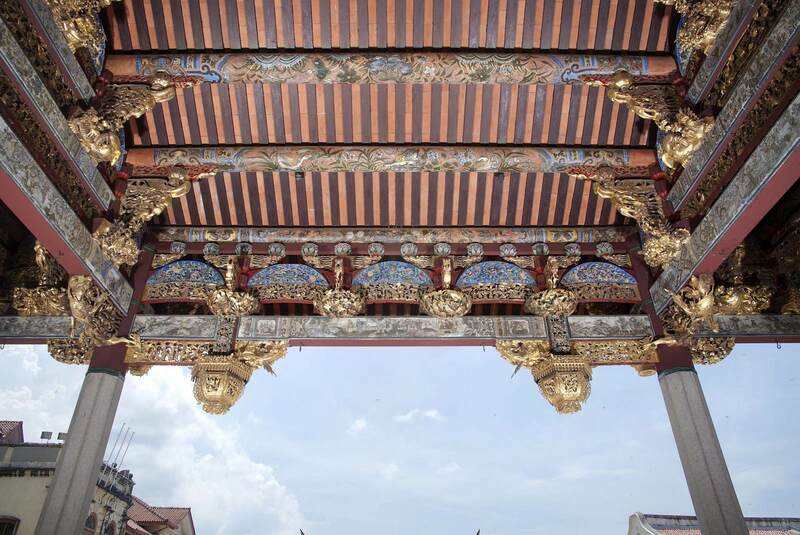 Aesthetes would love the intricately exquisite gold-leafed carvings of the richly ornamented columns beams and brackets, which have fused aesthetics and function into an inseparable wholeness. 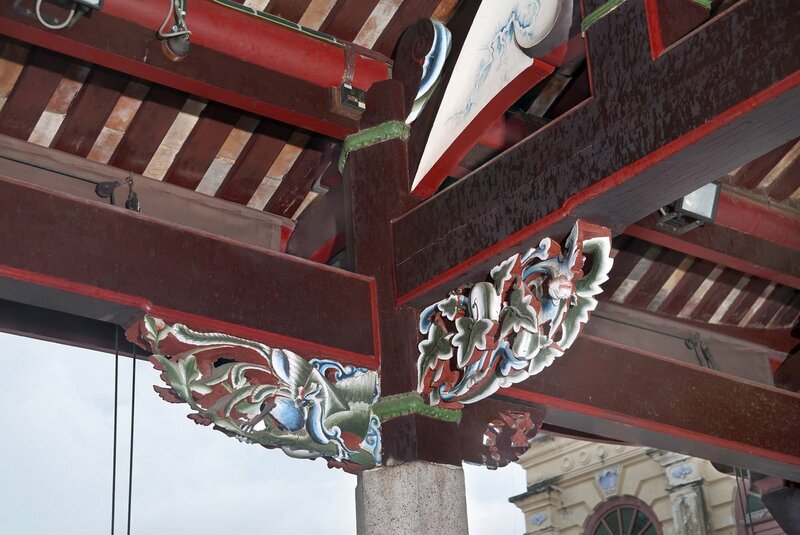 For the roof beams with delicate paintings that were once damaged beyond repair, special efforts were made to peel off the paintings and rewrap them onto the new beams. And the result is nothing short of spectacular. 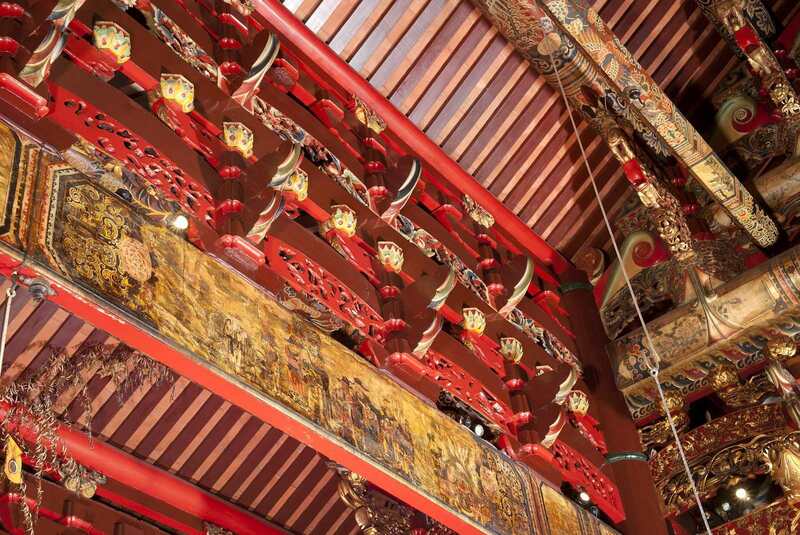 The Khoo Kongsi and many more institutional and commercial structures enhanced by the use of Malaysian timber are featured in MTC’s newly published book ReThink: A New Paradigm for Malaysian Timber. 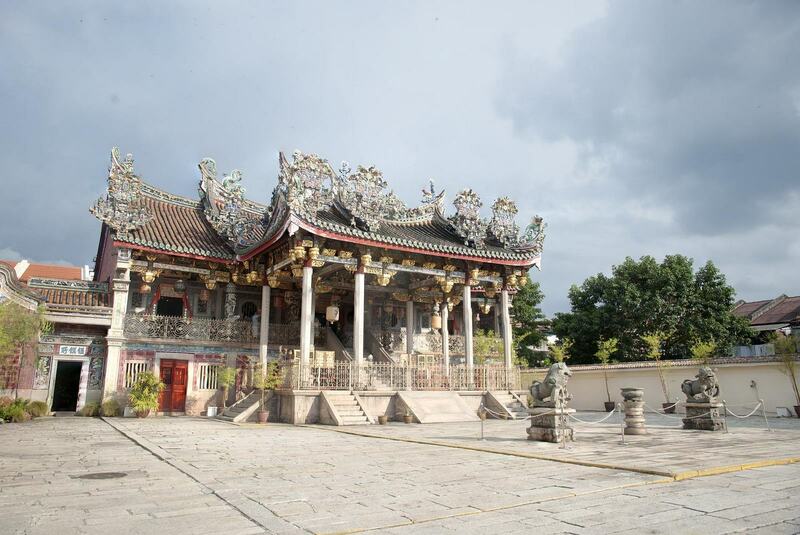 Co-published with MPH and available at MPH and leading bookstores in Malaysia and Singapore, the book showcases breathtaking projects in Malaysia, Singapore, Mauritius and the Maldives. Please email Mr. Andrew Kong (andrew@mtc.com.my) or Ms Kuraibah Zakaria (kuraibah@mtc.com.my) if you wish to purchase a copy from us.